A specialized tray that let's you make all natural frozen fruit, vegetable and meat bones in dog bone shaped ice cubes, with your own hands, in your own kitchen, for your own dog! Make Fun, Healthy Treats For Your Dog! 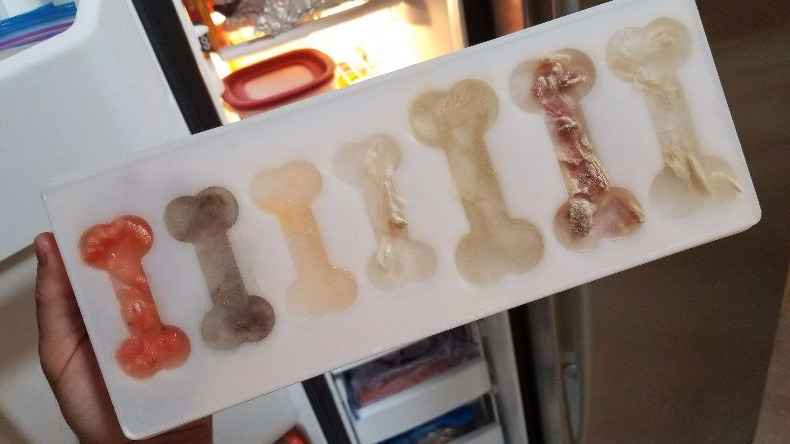 Just fill your ICE BONES tray with your dog's favorite flavors. 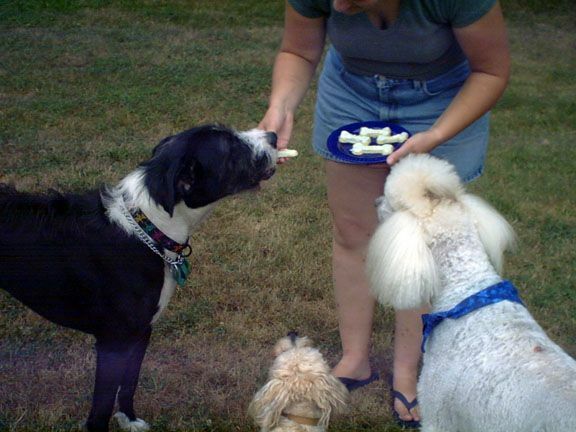 Serve your dog a fresh, healthy treat he'll love - ICE BONES! 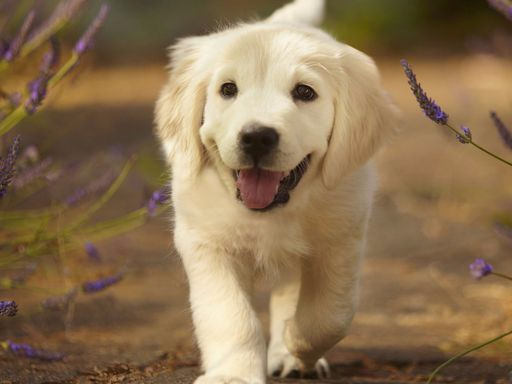 Treat Your Dog To A Fun, Healthy Snack! It's a fact, dogs love ice. This unique tray makes your dog all natural inexpensive treats, which come in different sizes. 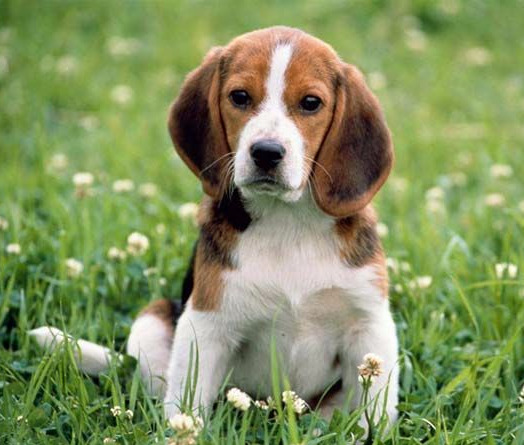 With ICE BONES you can make your dog all natural frozen fruit, vegetable and meat bones. 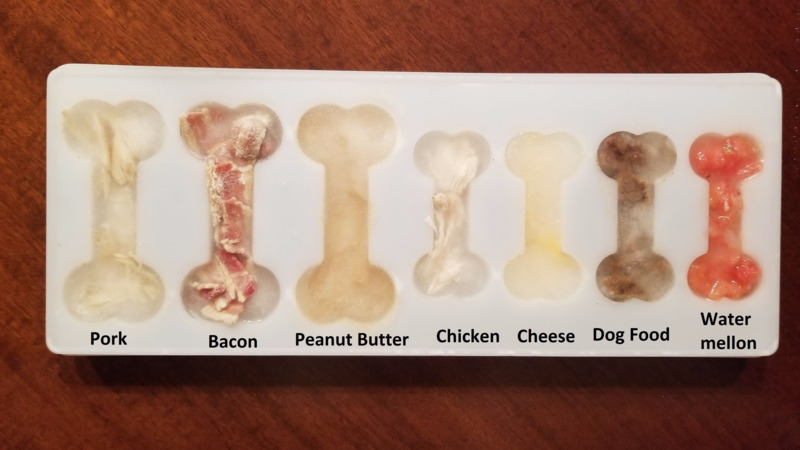 Just add any flavoring that your dog loves, like Bananas, Peanut-Butter, Carrots, Apples, Bacon, Salmon, Liver, Ham, Beef and Chicken Bullion and anything else your dog likes into the unique Ice bones tray, with warm water and freeze. My kids used to give my dogs ice cubes on hot days to refresh them. Then it hit me, "wouldn’t it be cool to have ice bone shaped ice cube snacks that have no chemicals, no preservatives, and no artificial flavoring and that are vertually free to make?" So I decided to create ICE BONES! 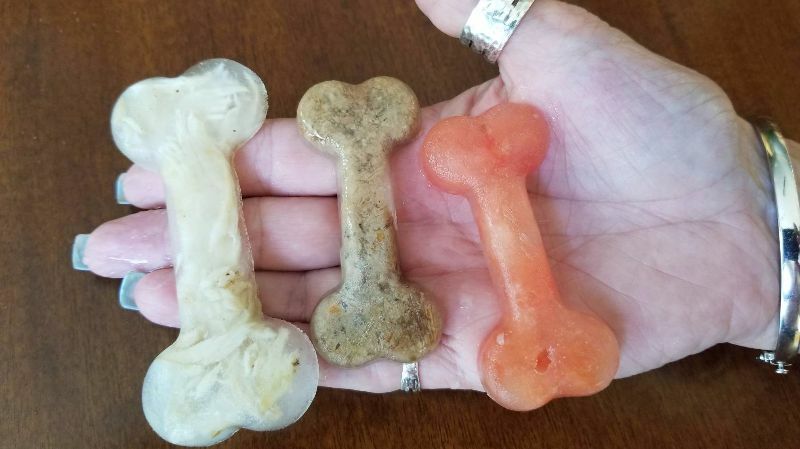 Now I could put whatever my dogs like to eat, such as meat, fruit and vegetables, into bone shaped ice cubes to make all natural frozen treats that my dogs love. 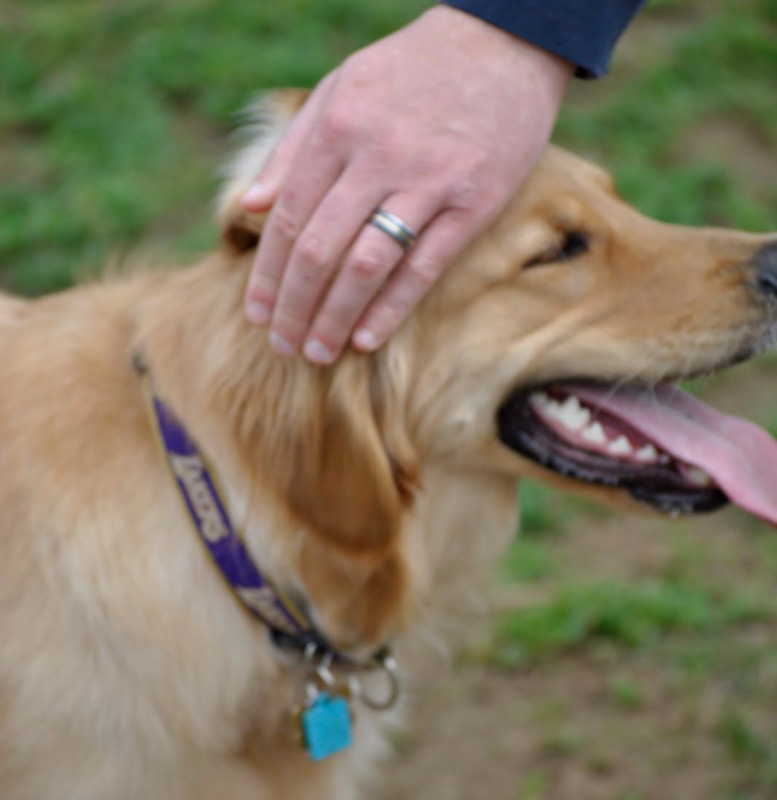 And as it turns out, dogs around the world love them too. 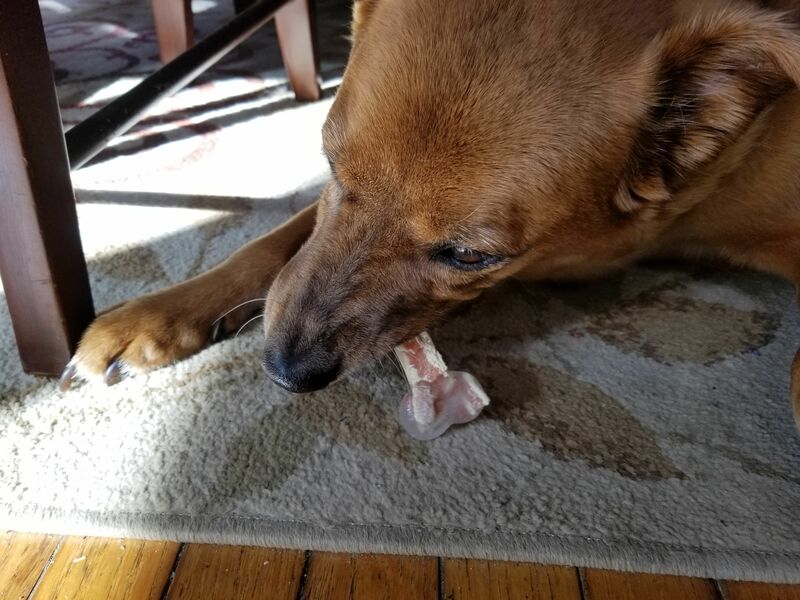 ICE BONES are also a great way to dispense vitamins and medication that your dog will love to eat. ICE BONES Aren't Just For Dogs! You can use ICE BONES to cool your soft drinks at your next party. People of all ages will love these fun ICE BONES too. Dishwasher safe, FDA approved. They make a great gift. There's nothing like ICE BONES, they're the coolest new product around. "First and foremost, I want to thank you for introducing me to the "ICE BONES" trays! They are a complete success for my dog, Gus. With this warm weather, he is able to cool himself off with these ice bones. I am able to mix a lot of goodies in these trays and freeze them. 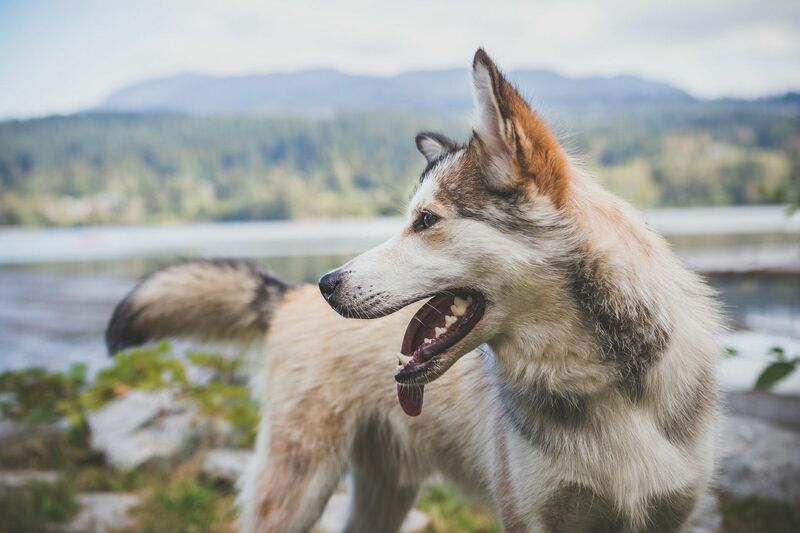 Once frozen, I am able to give them as treats to my husky, I very much recommend the "ICE BONES" trays to everyone.Thank you again for sharing these trays with me and Gus thanks you, too." "Hi, I bought one of your ice bones trays at the Pet Expo in Edison last fall. I sprayed a little Pam in the bones and put in a little cake batter, and then nuked it for 2 minutes. After the tray cooled, I pulled the bone-cakes out, and put a dab of icing on top. My dogs love it! Nobody got diarrhea, either. :-) Attached is a photo. Thanks for making a great product! " "I received my ice bones tray about 2 weeks ago. My dog loves them! I planned to use them just to make substantial ice cubes, but after reading the ideas on the web site, I opted to put a few slices of green pepper (their favorite vegetable) in them. The dogs were much more interested in the bones with peppers, and the peppers act as handles to help get the bones out of the tray. 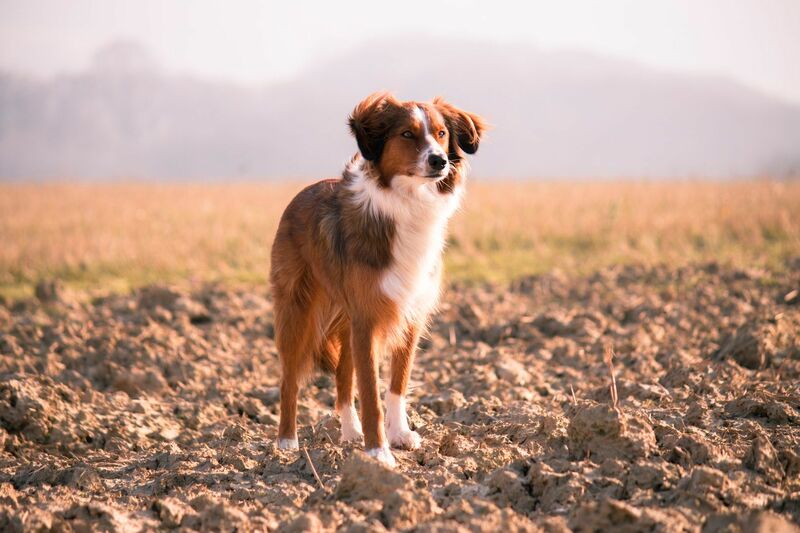 I'm very happy with my purchase, and so are Philip and Alpine (my dogs).Thanks for developing such a helpful product that creates practically free dog treats!" "Hi, I was at a grooming show and purchased three of your ice bone trays. I gave two away as gifts, and kept one. My dog, T-Bone loves ice, but sadly to say, he was just diagnosed with bone cancer. He just had his leg amputated, is receiving chemo, and we are blessed to have the opportunity to have him around for about another year (of course, it will be a fun filled year.) Well, he has been feeling nauseas, and I decided to try chicken and turkey baby food in the ice bones. I make my tray at night, give them in the morning, and then refreeze some more so he has some for supper time. HE LOVES THEM!!!!!!!!!!!!!!!!!!!! (I use Gerber Stage Two food, the ones with meat and gravy - dogs are not supposed to have onion which can be an ingredient in some jars.) Well, I just thought you would like to know that T-Bone is enjoying the ice bones. Thanks so much." Order Ice Bones For Your Dog Now!